Deaf dogs: Georgia is a 2 year old Tibetan Terrier. She is a little treasure. She comes from a friend who raises Tibetans and wanted Georgia to have a home where her deafness would be understood and she would be happy. She came to us on Thanksgiving morning and we are very thankful for her. She is so full of love and knows many signs. No one would ever know that she is deaf. I would recommend a deaf dog to anyone that is considering one. They have so much love to give and outside of the fact that you can never leave them off lead, they are just like a normal dog. Other pets: A Tibetan named Megan (who will go find Georgia when asked, and nudge her till she comes!) and two Keeshonden named Lance and Falcore (who became deaf in his old age - Falcore went to the Bridge in May of 2001, and is very deeply missed). 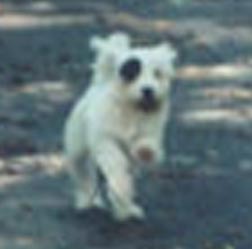 Deaf dog: Pendragon is a 6 year old Dalmatian. She is a sweet fun-loving liver spotted doggie. She is exelent at reading facial expressions. She is our first experience with a deaf dog and we love it. Deaf dog: Cheeba is a 2 year old Jack Russell Terrier. Her family says "Cheeba is awesome. Very energetic, loves people, and does not bark excessively. We, my boyfriend and I, got him from someone who was moving out of town, could not take the dog. He was going to be put down when we heard about him. He has brought me and my boyfriend closer together. He's great and a good listener!" Deaf dog: Rhett is a 6 year old Boston Terrier. His family says "Rhett was found at a kennel, days before he was to be put to sleep. 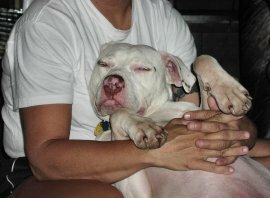 Because he was deaf and hyper the people at the kennel assumed that no one would want him. Rhett was 10 months old and had spent most of his life in a cage. When I got him he had no trust in humans. He would cower in a corner if any one approached him. I know that he had been abused at some point because he would snapped at anyone who didn't slowly go up to him and pet him on his back (no other area could be touched). I am amazed at how different he is now, with complete trust in people." 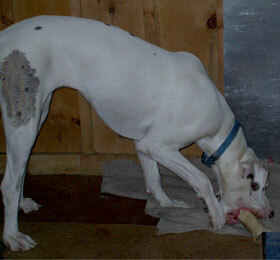 Deaf dog: Skamp, a Great Dane. "Skamp is now a year old and just the most loveable dog I have ever owned. How anyone could ever think of putting these dogs to sleep is just unbelievable to me. Skamp loves to be near us all the time. He has really become attached to my dad, he sleeps on the couch with him all the time. Skamp tries to play with our two Shelties that he thinks are the "big" dogs of the house. He is a very happy dog who has learned tons of signs (especially go for a ride). We are all so happy we got Skamp." Human companions: Dani Klebacha, her parents, Anne & Chuck, and her brother Andy. Other pets: 6 dogs. 1 cat. and a fish. Deaf dog: Quinn is a 1 year old Pit Bull. "Quinn is the sweetest dog next to Zeus, our other pit bull. Quinn came from Animal Farms Foundation, a rescue located in New York. He was found with his mother and sister who were too sick to save. Animal Farms rescued Quinn and took care of him till the perfect home was found." Human companions: Marcia Kratzenberg, Charlie, Jake, Jimmy and Jaime. Other pets: Zeus, a Pit Bull; and Ben and James, cats. 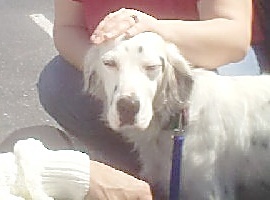 Deaf dog: Maximus (aka Ricky)is a 1 year old English Setter. "I got Max from the ACES rescue (Another Chance for English Setters). Max is such a love bug. He loves to hug and kiss, and he LOVES to be petted. He's a very "birdy" dog and has a beautiful point. He could sit there for 20 minutes and point! Max does not know he is deaf, and is just the sweetest thing. Thanks to ACES for bringing Max into my life." Other pets: Sullivan, 1 yr old Min Pin; cats, Puck and Pandora; Gizmo, the horse; Ren and Stimpy, fantail goldfish; Apollo, yellowbear Hamster. Deaf dog: Chicky is a Great Dane that is 9mts. Sam's Little Chiclet aka miss Chicky was born here. We raise Great Danes. Just one look at her eyes and sweet face and I fell in love. I had offers from people to buy her but she had already stole my heart. I knew she was already home. She is a joy to live with. She is also the best listener in the house. She is playfull, silly, goofy and just full of life. Human companions: I live with my husband Eric and our friend and helper Holly. We have 2 grown boys that are married and 1 grandson and 1 granddaughter.